Just what is Weird US? It all started a long, long time ago and a land called New Jersey. Once a year or so we’d compile a homespun newsletter to hand out to our friends called Weird NJ. The pamphlet was a collection of odd news clippings, bizarre facts, little-know historical antic dotes and anomalous encounters from our home state. The newsletter also focused on the kind of very localized legends that were often whispered around a particular town, but seldom heard outside the boundaries of the community were they first originated. Something about Weird NJ seemed to strike a nerve with folk of the Garden State. Our little “zine” was getting passed around and finding its way into the hands of people we had never even met. And then a funny thing happened: all of the people that read it seemed to have their own weird tale to tell, and wanted to share it with us! So, with each new issue of the newsletter we’d publish stories by our readers, incredible firsthand tales of cursed roads and ghostly visitations. By and large these stories had never before been documented in print—or anywhere else for that matter. 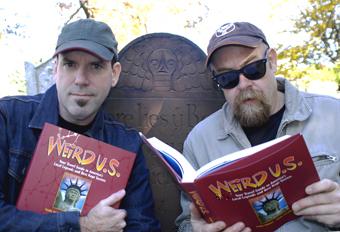 By the seventh issue of Weird NJ we started to realize that our little hobby had taken on a life of its own, and there seemed to be no end in sight to the amount of material that was out there waiting to be uncovered. We had started the publication with the simple theory that every town in the state had at least one good tale to tell. What we were beginning to find out was that this was a gross underestimation. Great stories were flowing into our Post Office box daily from all over the state—places we’d never even heard of! The more that Weird NJ got passed around, the more these never before heard tales would come in from all corners of the state. By the eighth issue of what was now becoming a full-fledged magazine we had made the decision to actually do all of our own investigating and see if we couldn’t track down just where all of these seemingly unbelievable stories were coming from. Was there, we wondered, any factual basis for these fantastic local legends that people were telling us? Armed with not much more than a camera and note pad we set off on a mystical journey of discovery. Much to our surprise and amazement, much of what we had initially presumed to be nothing more that urban legend actually turned out to be real, or at least contained a grain of truth which had original sparked the lore. Reporting about unique and mysterious sites and people, such as reclusive colonies of albinos and evil cult sacrifices in the woods, soon became an all-consuming preoccupation for us. 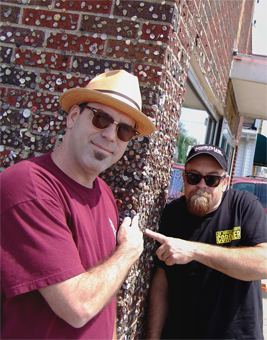 So much so that after about a dozen years of doing it we were asked to write a book about our adventures. After “Weird NJ: Your Travel Guide to New Jersey’s Local Legend and Best Kept Secrets” was published in 2003 another funny thing happened—people from all over the country began writing to us, telling us strange tales from their home states. As it turns out, what we had first perceived to be a very local interest genre was actually just a small part of a much larger and more universal phenomenon. People from all over the United States had strange tales to tell, which they believed to be true, and they all wanted somebody to tell them to. That is how Weird US came to be. So how do we decipher the fact from the fiction? How do we separate the history from the mystery? We don’t. What we do is listen to what people tell us is weird about their own hometown. We collect these stories and try, wherever possible, to corroborate these seemingly fantastic tales with actual events and historical data. Sometimes we are successful and manage to uncover a little known tidbit of historical validity, and sometimes we don’t. If we find that a local legend is patently untrue do we refrain from publishing it? Absolutely NOT--not if it’s a great story! So how will you, the reader, know which stories are real and which are imagined, and where to draw the line between fact and fantasy? That’s for you to decide. We merely present these local legends to you in the most unadulterated form possible for you to ponder. We document them because we believe that they are an important and intrinsic part of our modern America culture and worthy of recognitions as such. One thing we will tell you though, none of the stories in this book are fiction—some might not be completely true, but none were made up solely for the purpose of entertainment. All the tales contained here reflect actual people or events, or recount an existing legend of a site-specific nature. What does this mean to you? It means that you can actually GO there and see for yourself where these stories took place and in some cases are still taking place right now! That is the most important distinction between Weird US and your run-of-the-mill collection of tired old urban legends—this book is a travel guide! Now, having said that, we must point out that just because you can go to all of the places featured in these pages, that doesn’t necessarily mean that you should. 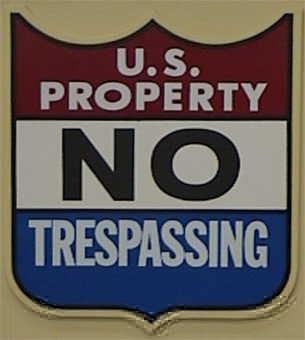 Some of these sites are located on private property and we do not in any way recommend or condone trespassing or breaking any laws to visit them. Please leave that up to us--we’re professionals. Other sites, such as abandoned buildings, can be extremely dangerous and are probably better left to the imagination. For this reason we often refer to our journal as a “travel guide of the mind.” We present many of the sites featured here not as destinations to be explored, but rather as the catalysts of local mythology.